Have you guys tried Chobani Greek Yogurt? 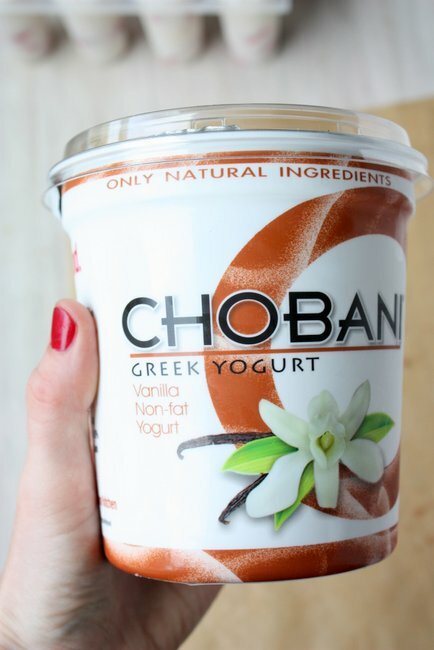 Chobani makes a huge variety of flavors of Greek yogurts, all of which look amazing! I know the ones I’ve tried have definitely been phenomenal. I like Chobani because they don’t use any preservatives or artificial flavors, their yogurt has 5 live & active cultures, AND they don’t use gelatin or animal-based thickeners. YES! They also use natural fruit in their yogurt, and you definitely can’t go wrong there. I’ve been using Chobani in my cooking for a while — adobo chicken pasta, skinny raspberry cheesecake, lime doughnuts, raspberry doughnuts, and many more you haven’t seen yet! When Chobani contacted me about sending some different varieties to me to try, of COURSE I said yes! We actually eat quite a bit of yogurt in this house, on top of using it to cook with! It arrived last week and I was thrilled to see a nice selection of non-fat plain, low-fat plain, and non-fat vanilla. Derek was skeptical about using non-fat vanilla on his cereal, but has now been convinced that it’s just as good as full fat. Really, it’s so creamy and thick I don’t think anyone would be able to tell the difference. While I have many many more recipes to share with you later in the month, most of them will have to wait since we’re heading to Alaska tomorrow! Woohoo! I’ll still be posting, but yogurt-centric posts will be a bit delayed. 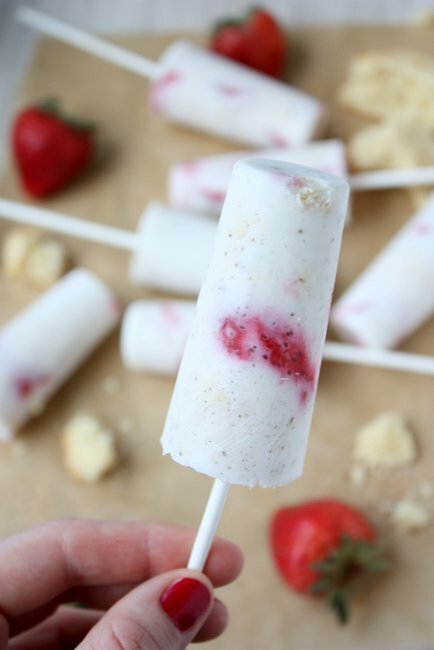 For now: strawberry shortcake popsicles! Um, yes please. 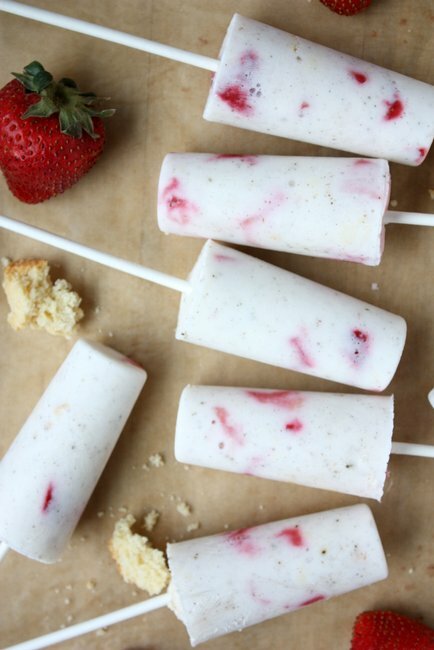 At first I thought “ooh strawberries and cream popsicles!” upon seeing the vanilla yogurt; however, I’ve been down that road before. I thought I should branch out. I also happened to have some extra shortcakes on hand, so what else was I supposed to do? I also LOVE frozen treats with bread (cookies, brownies, shortcakes, etc.) in them. Done. 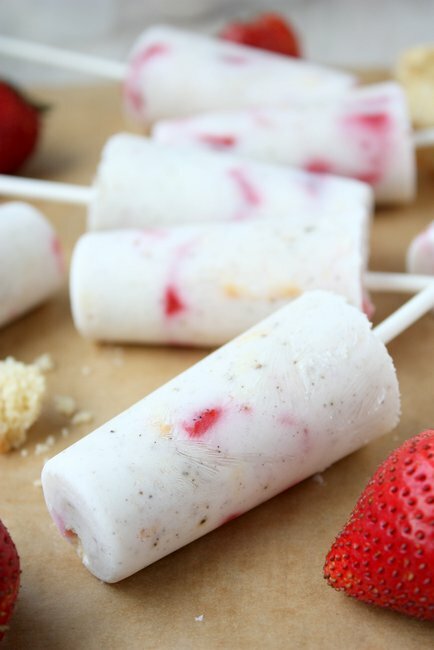 These popsicles are super easy to whip up: just mix some yogurt with some milk and ground vanilla beans, then gently mix in chopped strawberries and shortcake. Nilla wafers would also be a good choice! Freeze, and enjoy! I think these will become a regular treat in our household, now that Montana is finally heating up! 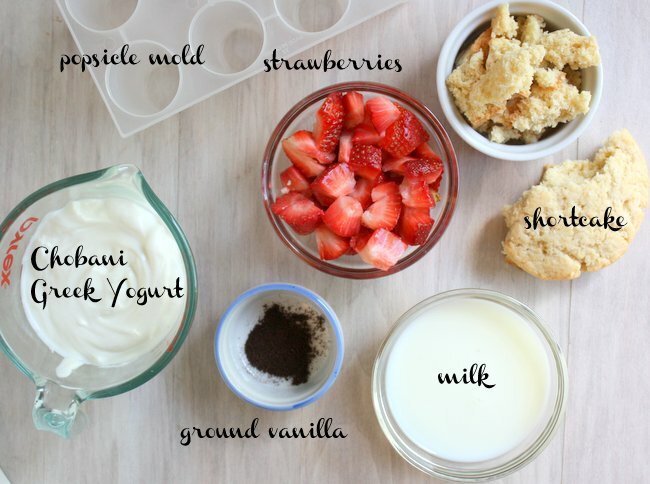 Keep an eye out for more Chobani recipes coming your way! In the meantime, go pick up a cup of their pineapple (YUM) and stick it in the freezer. Trust me. These are calling to me! 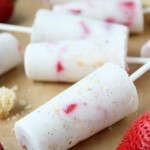 Just wanted you to know that I featured these on my blog today for National Strawberry Shortcake Day! They look fabulous! Of course! Everything you propose will work just fine! Love this idea.. Look delicious ! Where did you get your pop molds ? I got them from Amazon! There are a ton of different types… mine are pretty small, but I like them! Do you Have to purchase ground vanilla or can you make your own? I have fm vanilla beans on hand would it be as simple as grinding them up? I found some at my local grocery store, but you can always order them from Amazon! 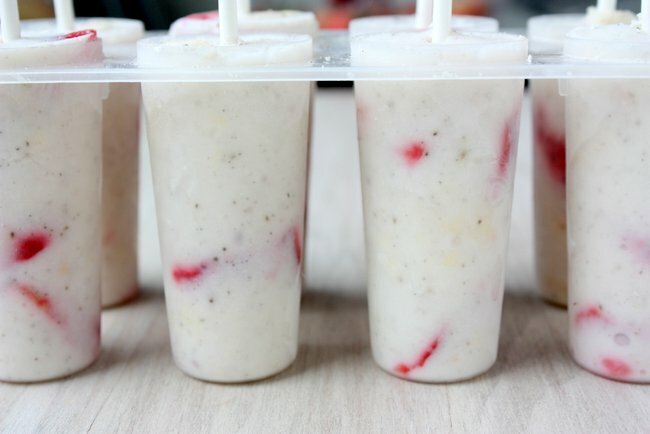 Just popped a “red, white, and blue” batch of these (minus shortcake + blueberries; plain yogurt but with maple syrup swirled in) into the freezer in honor of the 4th. Thanks for the inspiration and delicious pictures!